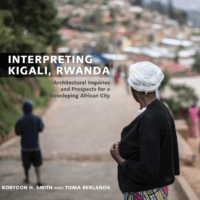 Interpreting Kigali, Rwanda by Korydon H. Smith and Tomà Berlanda explores the pressing challenges and opportunities to be found in planning, designing, and constructing a healthy, equitable and sustainable city. Asking “what is an authentic-yet-modern, prosperous-yet-feasible African city, Rwandan city?” Smith, Berlanda and colleagues conducted research on Rwandan activities of daily living and how these routines are connected to space-making practices and the Kinyarwanda terms that describe them. Through a culturally informed view of urban and rural lifestyles and spaces, Interpreting Kigali, Rwanda presents principles and proposals for neighborhood development in the challenging context of Kigali’s informal settlements, With one billion people living in informal settlements worldwide, a number expected to double by 2030, the lessons learned in Rwanda provide a complex, fascinating, and urgent study for scholars and practitioners across disciplines and around the world.